You might have already heard the news, earlier this week during Siemens PLM Connection Americas 2018, Joe Bohman announced that Siemens PLM was partnering with Obeo. 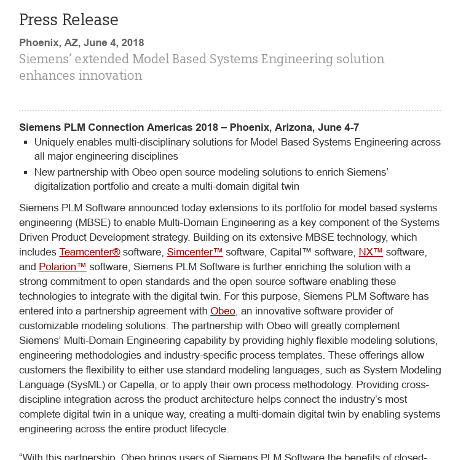 Here is the complete press release for more detail but in short: we are working with Siemens with either standard modeling languages, Capella, SysML or tools to support custom process methodologies in order to contribute to the true integration of MBSE - Model Based System Engineering, within the entire product lifecycle. This is significant in several ways. First it’s another strong data point demonstrating that MBSE is a key enabler in a strategy aiming at enabling multi-domain engineering. 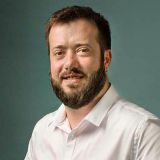 Second, it’s a public endorsement from one of the top high-tech multinational company that the OpenSource technologies built through the Eclipse Foundation and the Polarsys Working Group, in this case Acceleo, Sirius and Capella are innovation enablers. Our contribution is fundamental to those and as such this clearly strengthen these projects but also our vision and strategy! Even more importantly adopters of those technologies will benefit from new integration points and means to leverage their models during the entire product lifecycle, and that’s what modeling is all about: using the model, iterating over it, refining it; as a living artifact, one that is shared and not as something gathering dust in a corner. These are pretty exciting prospects ahead, no doubt this will be a central subject during EclipseCon France next week. Note that we’ll hold a Capella workshop during the Unconference and that it’s still time to register! Siemens partnering with Obeo on Model Based Systems Engineering solution - a major recognition for OSS Modeling Techs was published on June 08, 2018.